Readers of previous posts will not be surprised to hear that our very favorite thing to do in Maine is to visit lighthouses. There are over 60 in Maine, and many can be visited (a surprising number are within only an hour or so of Brewster House). We have visited fewer than half of them. Actually, visited is a bit of a stretch, as some can be seen from shore, but can only be reached by boat. 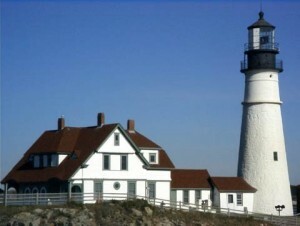 In any case, of the lighthouses we have visited in Maine, Ruth’s favorite is Portland Head Lighthouse. Commissioned by President George Washington, and a favorite location of poet Henry Wadsworth Longfellow, whose poem, “The Lighthouse” is said to be inspired by this majestic beacon. Scott’s favorite (though he says it is a close call) is Pemaquid Point Lighthouse, which stands above a rocky slope down to the pounding surf, which affords wonderful opportunities for photos of the lighthouse. Like many who visit Maine, looking for, and photographing, moose is a great adventure for us. As we’ve discussed previously, there are several places where searching for moose is likely to be successful. Having a favorite is easy, though, since we haven’t (yet) visited any other. We thoroughly enjoy the beauty of the Rangeley Lake area, and have always been able to find moose. We love the craggy rocks along the Maine coast, so exploring it is one of our favorites. We love the rocky coastline near Pemaquid Point Lighthouse, or near Bass Harbor Lighthouse, but our all-around favorite is much nearer to home. We love to visit Reid State Park and the village of Five Islands. The views are absolutely magnificent, and at Reid the boulders give way to a sandy beach that glistens in the sunshine. For us, this is Maine! Where are your favorite spots? Leave replies in the comments!